Sober Coach and Mental Health advocate Rod Pedersen hopes his personal journey of battling with alcoholism can make a difference to help others to find a way to recovery. 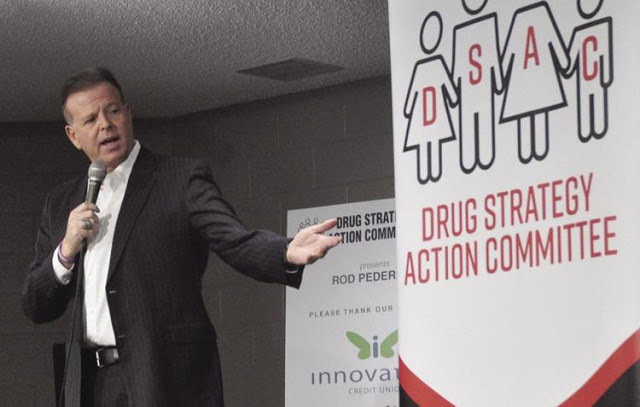 The Drug Strategy Action Committee in Swift Current hosted two events where the former voice of the Saskatchewan Roughriders shared his story. A community presentation took place during an evening event at Walker Place on April 7 and he spoke to Grade 9-12 students at Swift Current Comprehensive High School the following morning. He struggled with anxiety since a young age, but he only realized he was suffering from mental illness after he began his recovery. He discovered alcohol at the age of 16 and it became a magic tonic that made it easier to talk to people and also took away his anxious feelings and fears. His drinking habits became worse over the years until his life was completely taken over by alcohol. An opportunity in 2014 to become the voice of the Calgary Flames never materialized because someone warned the team that he was an alcoholic. After that disappointment he drank even more and he received a warning at work, but it made no difference. He had no more joy in life and went to see a doctor, who prescribed anti-depressants without addressing Pedersen’s excessive drinking. He started to use more pills than the prescribed dose, because he thought it will help him to feel better. The use of anti-depressants and heavy drinking caused his rock bottom on Jan. 26, 2015 at the radio station, when he went on air in an intoxicated state. He was suspended and his first day of sobriety started the following day, when he was told to either get into recovery or lose his job. He spoke for the first time in public about his alcohol addiction at a recovery day event in Regina in September 2016. He was surprised by the positive response and he was contacted by people from across Canada who told him how his story helped them not to drink. Since then Pedersen has realized he can make a difference by sharing his story, and that there is no shame in doing it. He believes it is important to speak to young people about mental health issues and alcoholism, because he knows what that experience was like when he was their age. He still remembers an important moment in his life when he was nine years old. A speaker at his school warned students not to do drugs, and that advice has prevented Pedersen from ever getting into drugs, even though there were many opportunities over the years. He did not plan to become a sober coach, but it happened and he is now the founder and CEO of Pedersen Recovery. He has a diploma as a drug and alcohol treatment specialist and he is a trained interventionist. Pedersen pointed to his “One Day at a Time” wrist bracelet, which symbolizes his approach to life since he started his recovery. He believes the legalization of cannabis was a bad decision, and he hopes the taxation revenue will be used to fund prevention and recovery programs. According to Pedersen there is still a shortage of aftercare programs in Saskatchewan and elsewhere in the country. The presence of sober homes in communities can make a difference to assist individuals with their recovery. He hosts the Pedersen Recovery Podcast, which is also something he did not plan to do since he started his own recovery. He speaks at treatment recovery centres around the country and people suggested he should start a podcast.